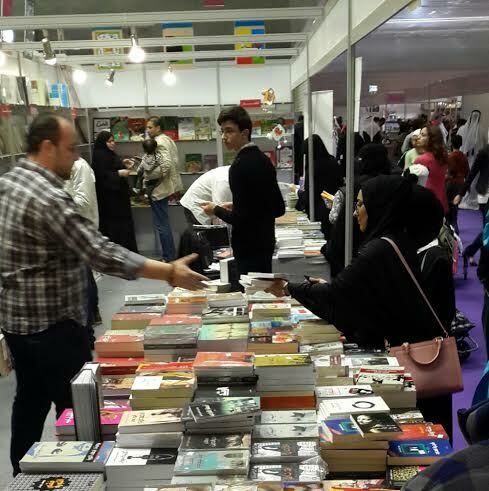 The Doha International Book Fair is undoubtedly the single greatest opportunity for Qatari residents to acquire books. The remaining 355 days of the year, we are left with scant options — Saudi Arabian franchise Jarir Bookstore (tagline: More Than a Bookstore!) with its Western classics and ho-hum Arabic offerings, Arabic-language counterparts to American supermarket novels at Carrefour, the unpredictable offerings of the two Virgin Megastores. Ordering online is always a possibility, but the book fair has the added bonus of pre-clearing all of the offerings through Qatari customs — although not always quickly enough, as the Moroccan Ministry of Culture found out. The exhibition ran from Wednesday, Jan. 8 through Saturday Jan. 17 — a vast affair, with stalls spanning the cavernous length of the new Qatari National Convention Center (QNCC), famed for its Louise Bourgeois spider sculpture Maman, in the foyer. The event’s English-language website, however, pointed potential visitors to the other-side-of-town Doha Exhibition Center for the duration of the fair. The location seemed to be a hindrance for many book-sellers and -buyers alike. Reaching the fair from the parking lot, for example, required descending a series of escalators, wandering for half a kilometer along people movers and hallways (where the first signs appeared for the book fair), up another escalator, up another escalator, under the Maman statue, past a café, along a walkway that ran over top of the fair, down yet another set of escalators, and then on into the Fair itself. 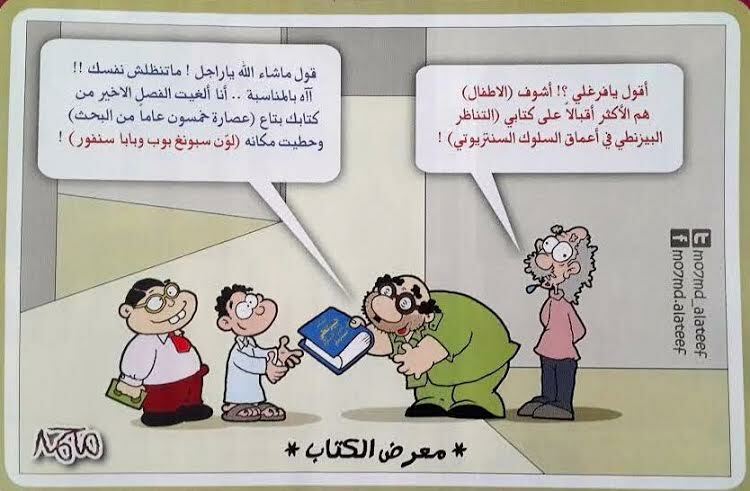 “Is anybody going to walk five kilometers for books?” said one Arab bookseller in desperation. The fair seemed lacking in organization. It had been delayed to January from the previous iteration’s December date, ostensibly to attract more customers, but was ultimately scheduled right on top of the January exams period for Qatari government schools, raising complaints and limiting the number of visitors on weekdays. …an early talk by Qatari novelist AbdulAziz Al Mahmoud (to promote his new novel The Holy Sail) was reportedly sparsely attended, though a later talk by Bamboo Stalk author Saoud al-Sanousi was nearly packed. I was initially stopped from entering on opening day because the fair was supposed to be VIP-only until the Minister of Culture Hamad bin Abdul Aziz al-Kuwari arrived. There were no complete schedules of events available on-site, though word spread quickly on social media for popular events — an early talk by Qatari novelist AbdulAziz Al Mahmoud (to promote his new novel The Holy Sail) was reportedly sparsely attended, though a later talk by Bamboo Stalk author Saoud al-Sanousi was nearly packed. Despite being billed as an international book fair, the focus was almost entirely on Arabic readers, with the vast majority of offerings in Arabic. A few stalls offered bestsellers, textbooks, or ESL texts in English, while the French Embassy managed to drum up a fair amount of business in Francophone titles. Map guides for the different stalls were only available in Arabic, and one Egyptian college student noted that the Ministry of Cultures Arabic website had made it “very easy” to look up specific titles and where to get them at the fair. Ultimately, this seems to be the unstated aim of the fair, whatever the side attempts at book talks or product demonstrations. It is a massive, once-a-year book market where all Arabic readers in Qatar and smaller numbers of curious outsiders can come to stock up on books. 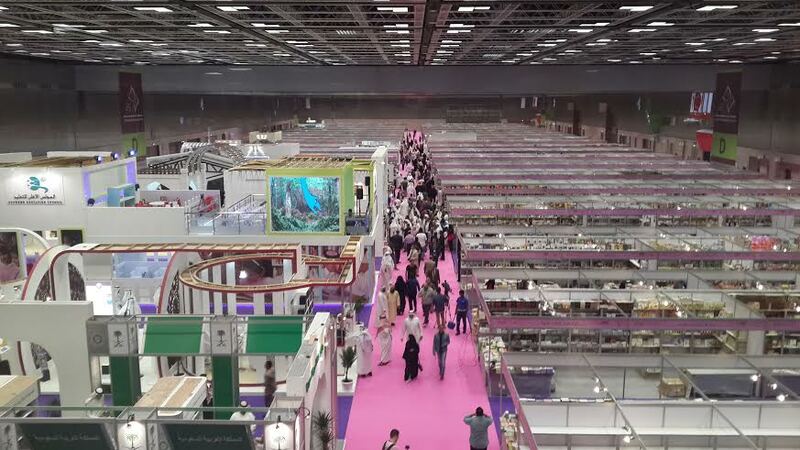 Many Qatari and Saudi visitors wandered the fair’s extensive Islamic literature section with large backpacks or rolling suitcases while young women crowded around to buy the latest compilations from Kuwaiti heartthrob poets. [Pink Sweater]: What’s this, Farghali?!?! Children are most interested in my book Byzantine Symmetry in the Depths of Centuriate Behavior? Farghali: Better believe it, man! Don’t put yourself down! It’s just… I cut out the last chapter of your book on “Synthesizing 50 Years of Research” and replaced it with “Color SpongeBob and Papa Smurf! Beyond most of the major publishers — Dar al-Adab, Dar al-Shuruq, Saqi Books, Dar Nahdat Masr — there was plenty else on display. A huge children’s wing had a range of imported English books and translated books for children as well as young adults. One alleyway of stalls was lined with Iranian artists completing paintings and works of calligraphy. The towering booths for the Saudi Embassy and the Qatari Ministry of Endowments and Islamic Affairs competed for sheer presence. A few stores for antiquities and rare manuscripts offered their wares, while Qatar Museums had all of its many art books available, many at substantial discounts. Doha’s own Bloomsbury Qatar Publishing Foundation had a fairly strong presence, though somewhat diminished from last year when it played a more direct role in promoting the Qatar-UK joint year of culture. Their sales staff ran a brisk trade in recent arrivals — Sonallah Ibrahim’s Beirut Beirut and Jabbour Douaihy’s June Rain, in English translation, and Al Mahmoud’s The Holy Sail, due out in translation some time this summer. The stall, and the presence of Saoud al-Sanousi for a talk and signings, also highlighted the forthcoming publication of Bamboo Stalk in English translation. A brief search near the end of the fair found that most had sold out of books on the 16-strong [International Prize for Arabic Fiction] list. It was pleasant to see the galvanizing effect of getting a book listed for the International Prize for Arabic Fiction in action. With the longlist announced in the middle of the fair, booksellers had no way to anticipate demand by stockpiling extra copies. A brief search near the end of the fair found that most had sold out of books on the 16-strong list. “None left,” said a representative from Saqi Books when I asked after Jabbour Douaihy’s The American Neighborhood. “And you’re looking for Daughter of Stanislov? We sold out as well.” Shortly after, I tracked down Dar al-Tanweer to ask after Shukri al-Mabkhout’s The Italian. “You’re in luck – last two copies of the last box,” the salesman told me. For next year, better information on scheduling and events, clearer directions to the site (both within the QNCC and within Doha), and a dedicated social media campaign to raise awareness about events and offerings would likely drive turnout even higher, while making better use of this once-a-year opportunity. Andrew Leber is an author, translator, and political scientist who lives in Doha. Reading your post really brought home to me how much we, in the UK, take buying books for granted! Thank you. Gosh that must be the day for all the book lovers to get together – and it’s sad that this doesn’t happen very often and that there’s not many local bookshops with good quality reads.